FEATURES/SPECS This elegant personalized treasure box is an ideal place to keep all of your precious keepsakes. 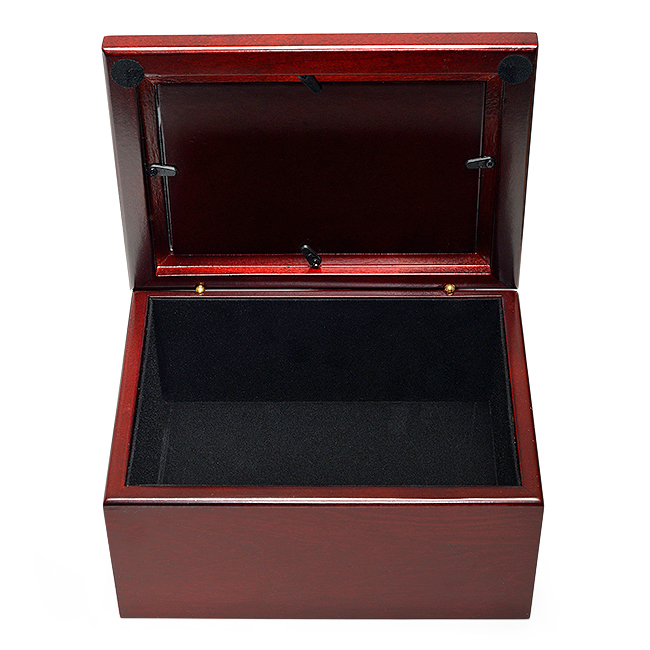 The outside has an elegant cherry wood finish and a felt bottom to protect your desktop or mantel. 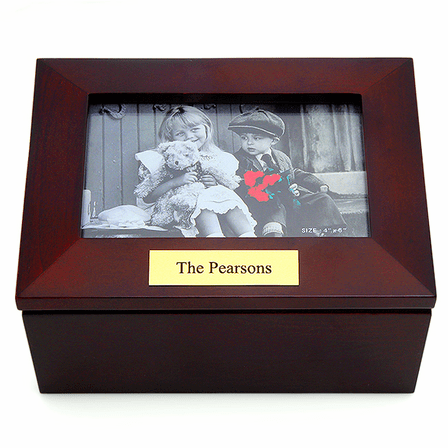 The centerpiece of the lid is a glass covered photograph frame. It holds one four by six inch photo. 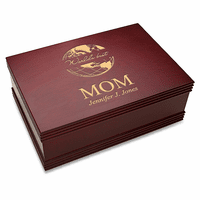 Add a custom laser engraved plate to the lid free of charge for a unique, customized gift. 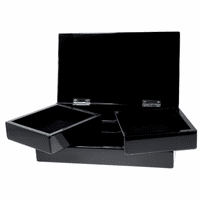 Inside, the box is lined with black velour to keep anything you store in here nestled safely. This personalized photo and keepsake chest comes packaged in a gift box, its ideal for an anniversary gift or a housewarming gift. Dimensions: 8" x 5 3/4" x 4 1/4"
Inside size: 6 7/8" x 4 7/8" x 2 7/8"
We can definitely do this for you. Go ahead and place the order right on our website. 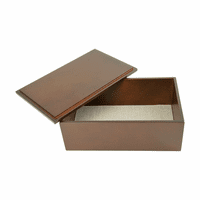 Add the box to the shopping cart on our site without engraving instructions. In the comments section of our checkout page, write your engraving instructions exactly as you did in this question. We'll make sure we engrave the quote exactly as you write it and we'll mount exactly where you specify. Please let me know if you have any questions at all. Is this item made of a natural product, i.e. wood? Yes, it is made of rosewood finished composite wood. On different pages, the box is shown with and without the brass plaque on top. In addition to two lines of engraving on the front of the box, I would like the brass plate on top of the box. How I can indicate this on the order form and how do I enter what I want engraved on the brass plate? We can't engrave the front as it would be too high to fit into our laser engraving machine. We would be happy to add a plate to the front and one on top as well if that would work for you. Just let us know what you would like engraved on each plaque in the comments section of our checkout page. Can you tell me where this is made? 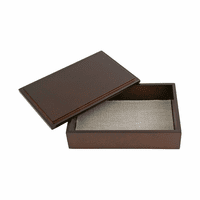 This personalized keepsake box is made in China. I bought this box as a gift for coworker whose grandmother recently passed away. When she opened the box where it came, she was very touched. She was thankfull to have a keepsake box where she could keep her grandmother's pictures and jewelry. The wood is beautiful and photo frame is detailed. I was mostly impressed with engraving (Spanish words), especially no misspelled and letter font. I definitely would buy from website again and recommended to everyone. The box was beautiful and of good quality, however the nameplate was cheap and slightly crooked. I will try to get it replaced with a better one that I will pay for since this one was free and the quality reflects the fact that it was free. This product exceeded my expectations! This item is a great quality. Has a rich look and having the option to personalize it makes it even better. So very pleased with this purchase. It came quickly, just as ordered. Fantastic quality. Great fast service. Good quality and beautiful finish on the box. ProsBeautiful finish and perfect size. Seems to be very well made.